Leading public relations expert Max Clifford has been arrested on suspicion of sexual offences. He was arrested by Met Police officers at 07:40 GMT at his home in Surrey. Officers from Operation Yewtree - set up in the wake of the Jimmy Savile scandal - made the arrest but it is not connected to the allegations made against the late BBC presenter. A solicitor acting for Mr Clifford said he was being interviewed by police and would assist them "as best he can". Max Clifford is one of the most influential figures in the British media. He is the sixth person to be questioned as part of Operation Yewtree, the Met's investigation into allegations, some dating back decades, that have arisen since the late Jimmy Savile was accused of abuse. One is looking specifically at the actions of Jimmy Savile and the second strand concerns allegations against "Savile and others". The separate third strand relates to alleged complaints against other people unconnected to the Jimmy Savile investigations. Scotland Yard said the man they took to a central London police station on Thursday morning was being investigated under the last strand of Yewtree's investigations. Five people have now been arrested and a sixth questioned under Yewtree. The four other people arrested are Freddie Starr, Gary Glitter, Wilfred De'Ath, a retired BBC producer, and radio broadcaster Dave Lee Travis. Police have also questioned under caution a man in his 80s. 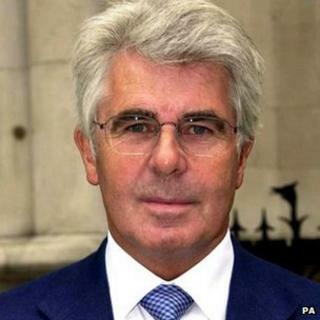 Charlotte Harris, of lawyers Mishcon de Reya, said: "Max Clifford is being interviewed by police. Mr Clifford will assist the police as best he can with their inquiries. When we are in a position to provide further information, we will."